This design was created because I love the idea of holiday heirlooms. Something you can make with your own two hands and hand down to family, year after year. My family is spread all over the country, but it’s pretty wonderful to have something I can send them through the holidays to keep a part of me with them. The customization is the best part though, whatever colors you want to match their favorite sport team, school, or favorite colors in general! 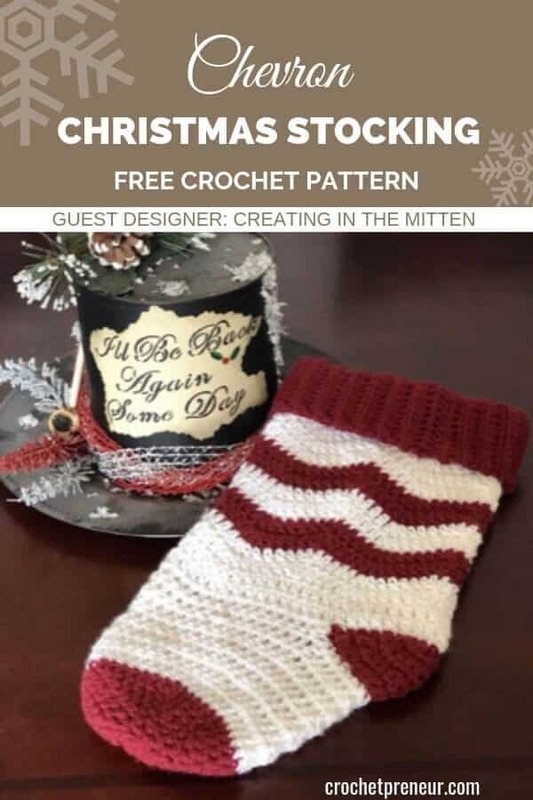 Purchase the premium pattern which includes instructions for the stocking, the hanger, and pompoms! Find it on Etsy. Gauge is not important for this pattern, if you are off by a few stitches that is okay. Row 2-6 – Skip the first stitch (where the chain 2 is) & repeat row 1 in Color A – white **skipping the first stitch will line up your chevron points. Row 15 & 16- change to white and DC around, sl st to join, chain 2 – do not finish off, but place a stitch marker here saving your spot. Row 2 – sc in the 2nd sc of the base row, and then sc across the chain (12), attach into the 15th sc on the base row. Row 3 – sc in the 14th sc on the base row, turn , sc across the chain (12), sc in 3rd sc on the base row. Row 4 – sc in the 4th sc on the base row, turn , sc 2 tog, sc across the next 8 st of the chain, sc2tog (10) and attach to the 13th sc on the base row. Row 5- sc in the 12th sc on the base row, Turn , sc across (10) and sc into the 5th sc on the base row. Row 6- sc in the 6th on the base row, turn , sc2tog, sc2tog, sc 2, sc2tog, sc2tog, (6) sc into the 11th sc on base row. Weave end through the 7 stitches and cinch closed, weave in ends. Attaching the band to the stocking. I know you’re going to love making the Holly Jolly Stocking and I so look forward to seeing your finished product. Creating in the Mitten was started by Samantha Bartley, a Michigan transplant and lover of all things yarn. She is a crochet designer, a fiber addict, and coffee has her wrapped around its finger. She has been crocheting for about 20 years but started her most recent journey a little over a year ago and has no plans of stopping now. Her crochet designs range from adorable cup cozy’s to beautifully detailed beanies, shawls, and garments. When she isn’t crocheting you can find her spending time with her husband playing video games or working on her second favorite love, photography.